In the Compliance Jobs Report this week, Fox News has a new head of compliance that it scooped from General Motors; QBE had one compliance hire arrive and another depart; other personnel news from Florida to Michigan, Canada to Brazil, and the private sector to the SEC. 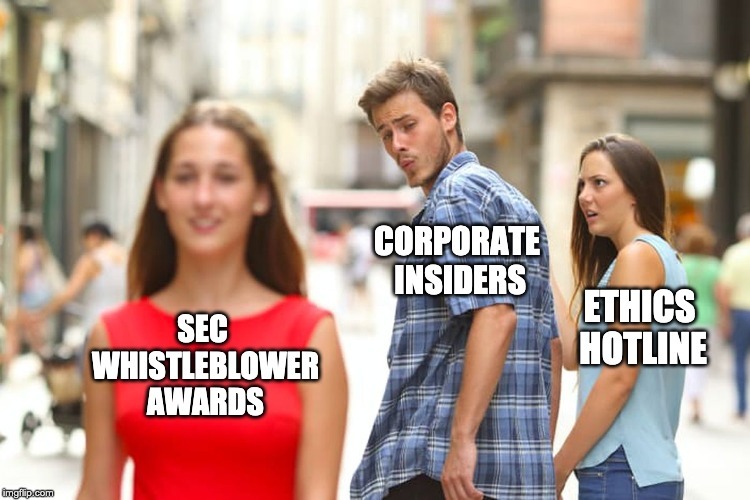 Our Meme of the Week goes out to all you whistleblower hotline managers. Jeff Taylor, the chief compliance officer for General Motors, has left that job to be chief litigation counsel at Fox Corp. (That’s the remaining media assets still owned by Rupert Murdoch now that he sold most of the business to Disney.) Taylor had been with GM for three years, and at Raytheon before that. H.W. Kaufman Group, an insurance firm based in Michigan, has named Kori Johanson to the newly created role of chief compliance officer. Johanson will lead the firm’s compliance team, work in company headquarters in Detroit, and report to CEO Alan Kaufman. That’s how you do it. Insurance firm QBE North America has named Monica Milner compliance officer. Milner had been running her own compliance consulting firm in Atlanta for two years, and prior to that had been senior manager of corporate compliance at Altisource. RPM International, a holding company in the specialty paints and coatings business, has named Brian Frasier director of global compliance. Frasier previously worked at Rush Enterprises (vehicle dealership business) as regional ethics & compliance director. Carmelo Stanco just turned up at Raymond James in Florida, as director of compliance. Was last seen at QBE Insurance as head of compliance for Latin America. DeAnna Looper has been promoted to chief compliance officer at Carrefour Associates, an Oklahoma outfit that operates Crossroads Hospice and Palliative Care in Tulsa. Looper has been working at Carrefour in various roles for more than 20 years. News from up north: SNC-Lavalin, the engineering firm based in Montreal, has reassigned Amee Sandu to be the firm’s human trafficking compliance officer and lead integrity officer for Latin America. Sandu has been with SNC in various compliance roles since 2013. News from down south: Oracle has promoted Daniel Sibille, one of its compliance executives in Brazil, from compliance director for Latin America to regional senior compliance director and deputy compliance officer. Sibille is based in Sao Paolo. And at the Securities and Exchange Commission, the agency has named Danae Serrano as ethics counsel (the closest thing the SEC has to a chief ethics officer). Serrano has been acting ethics counsel since December, and has held various ethics and compliance roles there since 2013. Speaking of the SEC, the rumor mill has again churned up Allison Lee as likely nominee for an open seat as Democratic commissioner. We’ve heard that before; Lee’s name first surfaced last summer, but for whatever reason President Trump hasn’t nominated her (or anyone else) yet. Lee was a top aide to former Democratic commissioner Kara Stein, whose term expired in December. Marc De La Cruz is celebrating one year at MUFG as a trade compliance and AML specialist. Not quite a vendor, but still relevant: the New York Federal Reserve has established a fintech advisory group to help banks understand how to use new technology wisely. First meeting is on April 1, which is not a joke. Exterran Corp., an oil & gas services company, is seeking a chief compliance officer. Job is in Houston. The University of Southern California just posted for an ethics & compliance program manager. People who have dropped $500,000 to bribe their kid’s way onto the water polo team may want to pass. City Utilities is seeking a chief internal auditor. Job is based in Springfield, Mo. That’s all for the week ending March 29. As always — if you have a tip or want to brag about your new job, promotion, career milestone, or anything else, email me at [email protected] or find me on LinkedIn. I’m always happy to give credit to the many hard-working people here in our corner of the business universe.